Uses: OpenStreetMaps, Yandex.Maps, Google maps. Old maps. The site is just super. Every possible old map is collected. You can find maps by cities, or you can press Select a map and get the explorer as in a computer with folders and subfolders. You can visually select a map. The base is incredible. When we select a map, we get to an interactive map, like Google or Yandex. However, why like Google or Yandex? - There are both Google and Yandex. Also there is a map of Bing, Wiki and OpenStreetMaps and a photo from the Google Maps satellite. That is, you can look at the old map, and then jump over to Yandex and immediately see how the map looks today. And you can make 2 Windows and look in parallel. You can choose maps by years. Just keep in mind, here old maps are tied to modern interactive map services, but they do not cover the whole earth. Each map on its own area. Some maps cover more space, and some less. Some have a higher resolution, some lower. We will be lenient and will treat with understanding. Aerial photos of cities USSR, made during the war. There are dozens of cities in the list. Pictures are superimposed on Google maps. To compare the city's photo of those years with modern satellite, select the full-screen mode and click on the link "2 in 1". One-verst maps of the territories of modern Belarus, Lithuania, Poland, Latvia and Russia. On the site you can see in parallel the old maps in parallel with the Google maps. There is a search and the ability to download maps. Search for ancient maps of the British Museum archive on Google maps. in the right panel see thumbnails of available maps according to our request. choose the desired map and get to the window with a description and a link to the archive where you can find and buy this card. The site has a developer's blog and a lot of passing information on cartography. 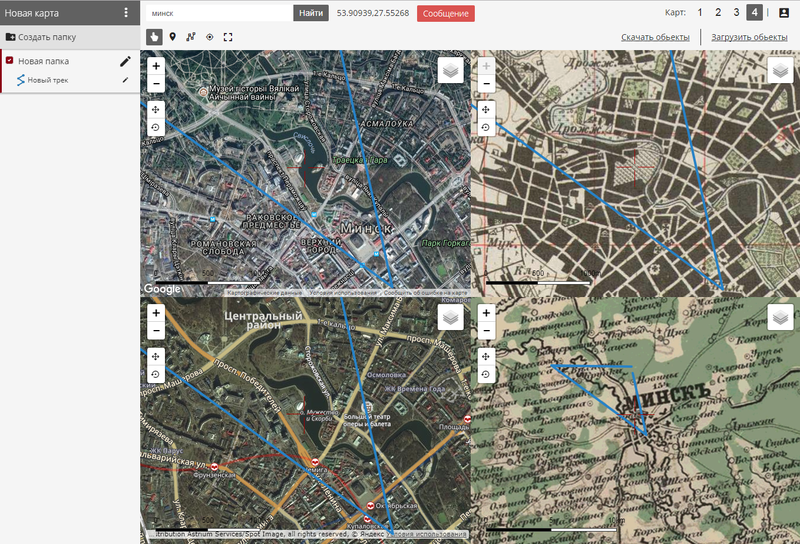 Parallel viewing of old and modern maps online. The site primarily presents maps of old maps of Moscow and Moscow region, St. Petersburg and the Leningrad region, a number of regions of Russia, there is something about Ukraine, Belarus, Moldova, Kazakhstan, the Baltic countries and the Caucasus. Here you can not only study in detail the historical heritage of the Russian, Soviet and foreign cartography, but also apply the information obtained for practical purposes. So, with the help of the site you can find out the history of your small homeland or all of Russia on maps of different times. What used to be on the site of your house, what names had populated areas and streets in ancient times, where it is not worth buying an apartment - if the house was built in a former landfill or graveyard, where there was a former village of your ancestors, where you should walk with a metal detector in search of treasure, where the search squads search for the unburied remains of our soldiers during the Great Patriotic War - these and many other questions will help to answer our project. Our search base for geographical objects contains not only the names of settlements, but also the location of tracts, relief objects, old names of the times of the USSR, the place of abandoned villages. The selected piece of any map, you can print, save as a picture with a superimposed index, export in Google Earth for viewing in 3D, paste into your blog or on your local history site. If you are interested in the plan, you can download a waypoint WPT or GPX for a GPS navigator or a KML with the coordinates of this place. Almost any online card can be downloaded to your computer from the server and enjoy off-line access to the Internet. The maps are laid out in the format of images and PDF, as well as files for navigation programs working with raster maps: OziExplorer, OruxMaps, Androzic, Locus Map, Locus Pro, AlpineQuest, Galileo Offline Maps, etc. What the earth looked like many, many years ago. On the site of the globe, like, like on Google maps and you can set the time in millions of years and see how the continents looked. Of course, everything was very, very approximately so, because then cartography did not exist and scientists guess with a high degree of probability in time and place. So the site just gives a general impression. 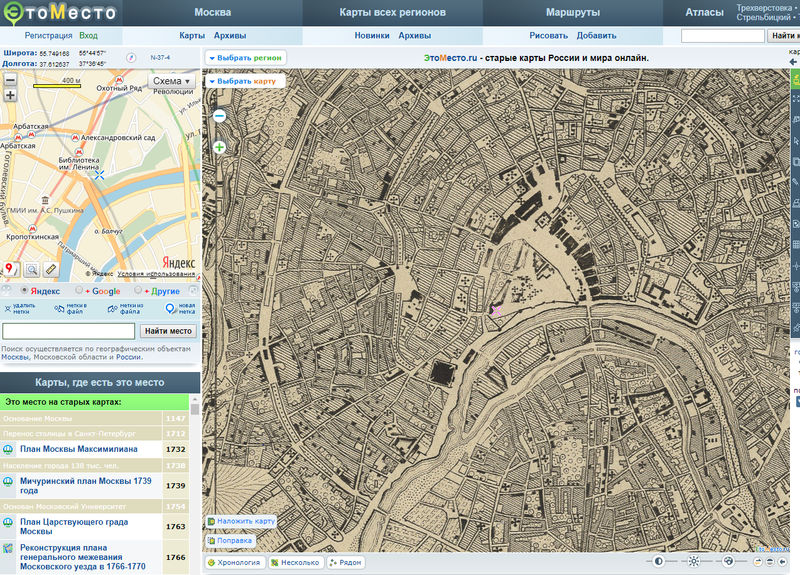 The site presents the old maps of Moscow and the Moscow region from ancient times to the present. 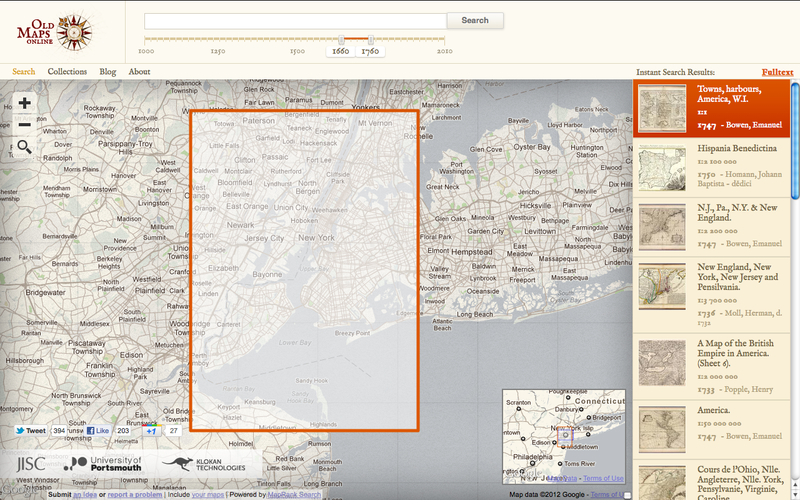 For all maps, online browsing is available in high resolution. 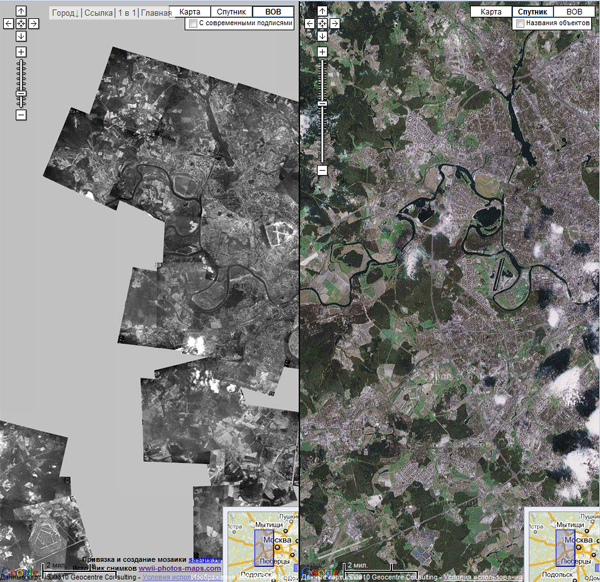 With the Map Overlay function, you can compare any old Moscow plan with modern maps and satellite imagery.